I like to fool myself into thinking that anyone could possibly be interested in my creative process, the inner workings of my designing mind at the earliest stages of making things. Hence, WIP (work in progress). Everything here represents an idea in formulation, not remotely finished. This is how it begins with earrings. Vast supplies in my studio. Many little things scattered on every available surface. One day the things… they start making their way toward one another as if by some poetic pull. 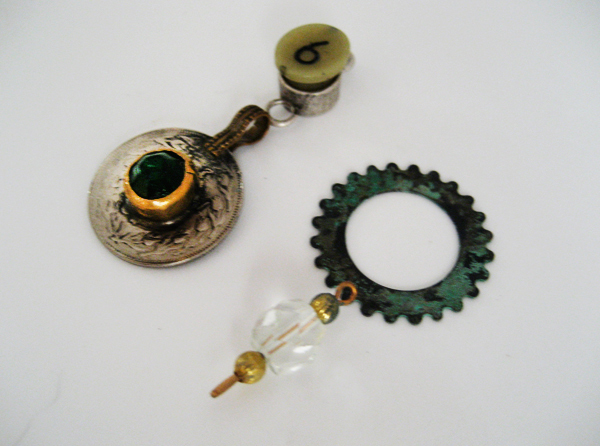 At the top of the post, an Afghani coin finding with brilliant emerald glass, a gear with verdigris patina, an ancient crystal bead and a piece of industrial trash. 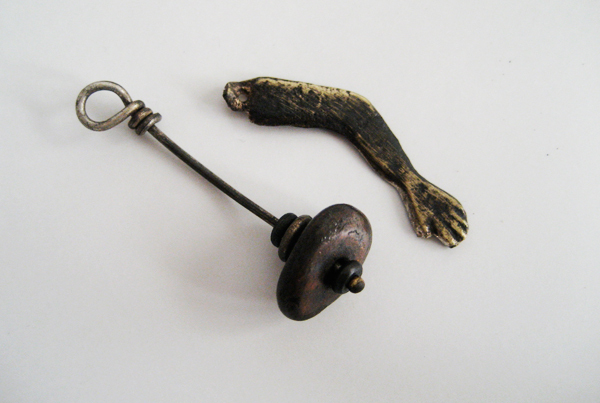 Above, a newer finding paired with a Mexican milagro. 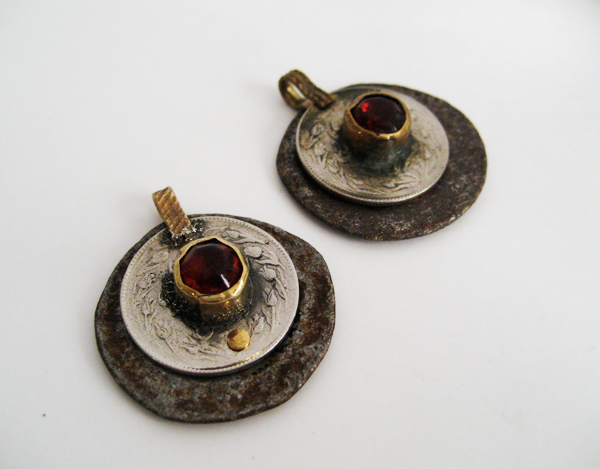 More Kuchi coins above (these are used in traditional costume including belly dance) with lovely glass rubies, being riveted to a pair of seriously rusted bottle caps scavenged from some American desert. Fiber may be added at some point. 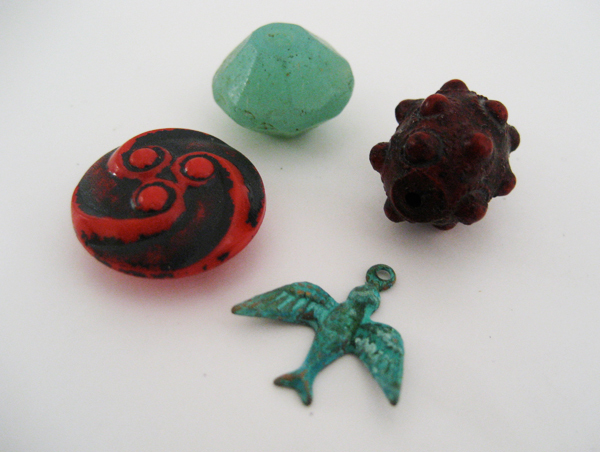 How do these tiny objects — a old discarded button, an African Vaseline trade bead, a bumpy middle Eastern bead, a tiny verdigris sparrow — come together? Some ways might be: color, form, content, texture, juxtoposition of cultures and histories. Things that resonate as similar or opposite, or both. The rule of chance encounters. The joy for me is that I don’t think much about any of this. Part of it is the trained eye, the practiced hand, designing for years, decades, a lifetime. Part of it might be something inaccessible; dreams, associations. 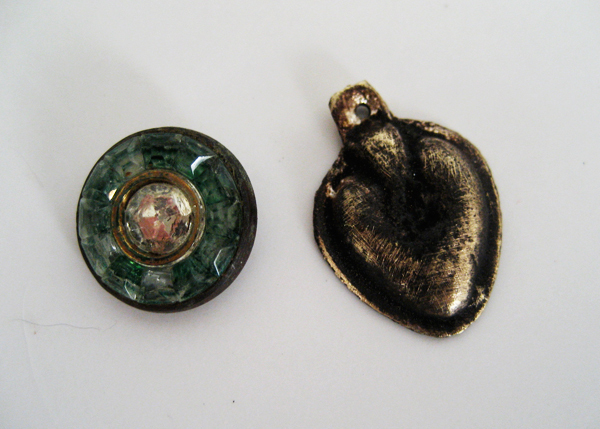 Above, an ancient glass button, possibly 1920’s, likely European, paired with a Mexican heart milagro charm. A tiny visual poem begun, beauty, an adornment.